With over 31 Million Users, Hero Zero is one of the most successful free to play Online Multiplayer RPG games. Create your own superhero character in a funny, exciting and fascinating universe with hundreds of villains, criminals and bosses. Fight and stop crime in different parts of the world to become the most powerful and celebrated superhero in the universe. Only you can bring justice and peace back to the world. Unlock hilariously powerful gadgets and upgrades for your hero to equip him for epic battles and challenging single player missions. Build your own Hide-Out as a secret base, which will be placed under your house in Humpreydale. Upgrade and modify your shelter in order to get better rewards and increase efficiency. 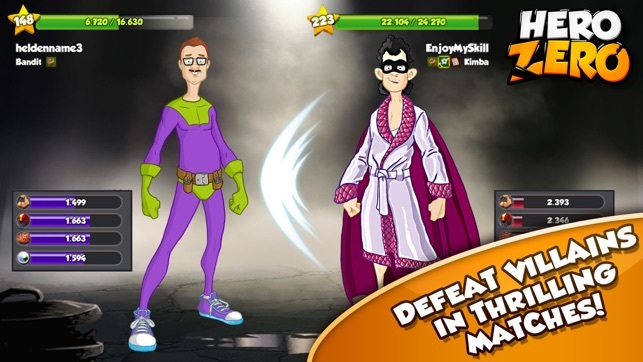 Compete with other players to find out who build the best Superhero Hide-Out. Join or create a team with your friends and build your own headquarters to fight more efficiently against all evil villains, criminals and bosses. Compete with other players and teams in exciting and cool multiplayer fights. Nobody can stop you from climbing the leaderboard on your challenging mission to become the most successful superhero in the world. Features: 31 Million Players, Regular free updates and new content -Free to play! 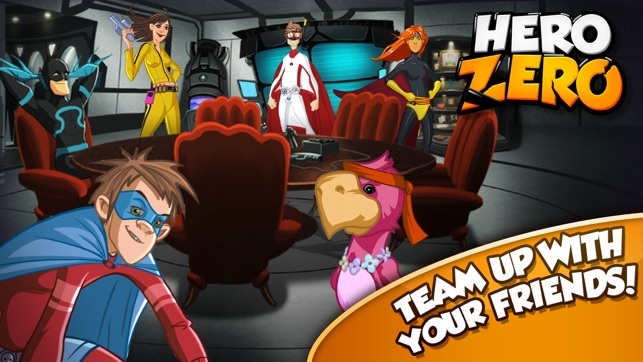 -Create and customize your own hero -Build up your own superhero team! -Challenge other heroes in PvP and team battles -Funny and fascinating storyline -Easy to learn gameplay -Appealing Graphics -Real time villain events with thousands of players. The game starts off with you being able to customize your character. Start by choosing which gender you are playing as, and then the fun starts… change your hair, facial features even your eyebrows! Then you can choose a few basic options for your hero’s costume. To start your Hero is a nerd, and he has limited costume options… a bathrobe and a hair dryer are your 1st few options. The game will begin with a short tutorial round where it takes you through the basics of gameplay. You have to complete missions too, tap on the redline phone (every hero needs a hotline!) This takes you out of your “lair/room” into the real world. There are various tasks you need to do to protect the civilians. Some are time based surveillance missions. You can speed up the time by using your donuts points... wait, you only have a few to start with. Some tasks reward you with donuts, but if you run out you can always buy more as an in-app purchase. There are fighting rounds also, in which you compete against villains. Depending on your strengths you may win or lose. You level up by completing more tasks. But you have to train to get better at these missions. When training you can choose from strength, stamina, brain, intuition. Even the clothes you wear enable you to possess certain abilities. Update your look in the second hand shop, where you can choose from an array of items. If you find or buy items that you don’t like, you can see them for coins to buy other costumes. A really cool feature is dueling. You can fight against other players who are playing online. Duelling allows you to win extra points, rewards AND rank up your levels. But duelling requires donuts, so pick carefully…if you lose those donuts and points rank go down. You can even join or create a team whereby you can compete against other teams, do missions and gain some all important experience and points…maybe a reward or two. The game progresses out of the neighbourhood as you level up, and the missions become more advanced once your superhero status begins to soar. take yourself from Zero to Hero now!